We offer Pure Blue Tilapia, which is the best variety of tilapia for the home aquaponic gardener! 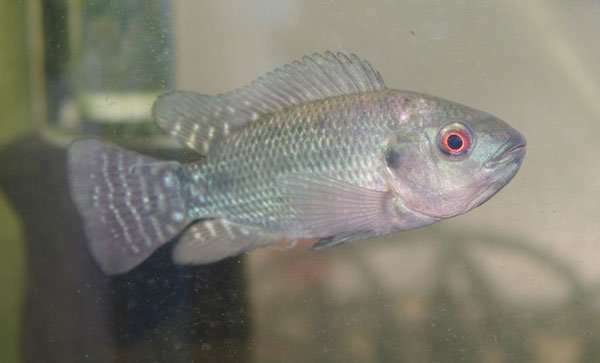 Pure Blue Tilapia (Oreochromis aureus) are a freshwater fish with a high tolerance for brackish and colder water than any other tilapia species. They reach plate size (12″ and 1 1/2 lbs) in about 9 – 12 months, although the adults can grow to 15 to 18 inches in length and weigh 5 to 6 pounds. Tilapia are mouthbrooders, and broods range from 160 to 1600 eggs per female. Our Tilapia fingerlings range in size from .5-1.5 inches and average about 1 inch. When will my fish arrive? Orders in by Sunday at midnight will deliver that same week on Thursday. Orders in after Sunday midnight will deliver the following Thursday. You can establish a sustainable, reproducing colony (approximately 50/50 male/female), and be sure that the stock we provide are raised in controlled, contained and secure facilities free from disease risk. We start aquaponic gardeners out with the best possible source of fish in every way possible, and for this price, that’s pretty hard to beat. Our fish are all hormone and GMO free. Guaranteed live arrival of your fish. During the winter months, when temperatures are on the low side, they also place a special heat pack in the container just to make sure your fish travel as safely and comfortably as possible. You will typically receive some extra fish to take care of that extremely rare occasion when a few of them don’t make the trip alive. Usually this just means you get a few extra free fish as they rarely experience mortalities in transit. All of our fish ship via USPS Express Mail . Shipping is a flat rate of $49 for all quantities up to 100 fish, except for catfish. Because the catfish are 2″ – 3″ in size they can only safely fit 50 in a box so quantities of 75 and 100 catfish ship in two boxes and cost $98 to ship. For quantities greater than 100, the shipping rates are as follows: $89.00 for 200, $149.00 for 500 and $199.00 for 1000. The hatchery carefully packs your fish in a special shipping container with just the right amount of water and pure oxygen and ships them to you. Orders for 100 fingerlings or less that are received by Sunday 5:00 pm Eastern Standard Time will be delivered to you Thursday of the same week. Those received after 5:00 pm will deliver the following Thursday. Orders for more than 100 fingerlings require an extra week for delivery. So those received by 5:00 pm Sunday will arrive Thursday of the following week. What if my state doesn’t allow the fish I order to be imported? You are responsible for understanding the fish import regulations for your state. If there is any question as to whether the fish you order can be legally shipped over your state borders please contact your fish and game department to learn more before ordering. Please note that we only ship to the 48 contiguous United States. What do I feed them once they arrive? We recommend our Tilapia StrongStart Fingerling Crumble for the tilapia, bluegill and catfish. It is a premium quality fish feed made in small batches by a family-owned producer in Missouri. We will replace fish or provide a refund for any shortages due to mortalities within 2 hours of arrival. We do however reserve the right to decide which (refund or replacement) is most appropriate/feasible for each situation. Shipping costs are non-refundable, and buyer will be responsible for paying shipping costs for any replacement fish. We require photographic proof of dead fish before we will approve a refund or replacement. Please place the fish on a white back ground to photograph them rather leaving them in the tank. We muse be able to count the dead fish in the photo. You must be present at the delivery location and physically receive the container of fish at the time of delivery as well as promptly place them in a suitable container (fish tank, aquarium, etc.) to qualify for refund or replacement. If your fish package arrives damaged please be sure to make a notification upon receipt. Please note, we can’t be responsible for fish left on front porches or similar areas. Sometimes fish will appear to be dead when in the bag when in fact they are not (they could just be stunned from the handling in transit), so regardless of what they look like in the bag, float the bag in your tank of warm (80-84 degree), aerated, conditioned and chlorine free water for 15 minutes and then release them into the tank. Please note that you must report any losses within 4 hours of receiving your fish. Official receipt time is considered to be the time and date stamp recorded by the shipping provider at time of delivery. This entry was posted on Thursday, January 10th, 2013 at 12:31 PM	and is filed under Hydroponics / Aquaponics. Both comments and pings are currently closed.